Archaeologists found more than 50 mummies in an underground maze in Saqqara, 25 kilometers south of Cairo, Egypt. The team of Egyptian and French archeologists believe the tombs were used from 660 BCE to 30 BCE, making the mummies over 2000 years old! And you thought your mummy was old! Aahi Hawass, the head of Egypt�s Supreme Antiquities Council, had this to say when he talked to Reuters (a place that supplies news stories), �It�s a maze of corridors with mummies everywhere, right and left, up and down. When people came, there was no more space so they put the coffins in the wall, or they cut another shaft, or they put a mummy above a mummy." The mummies were encased in wooden or stone coffins. They were wrapped in a cloth called linen and were in very good shape. "I have never seen ... a mummy from the Ptolemaic period that is so unique, that is well preserved. The linen is covering it in a beautiful way," said Hawass. The archeologists think the tombs at Saqqara may have been for a certain family or workers guild (people who do the same kind of work). They think a priest took care of the tomb and these mummies. Hawass believes the linen wrappings of some mummies could conceal a multitude of gold amulets (charms). Some of the charms are in the shapes of Egyptian gods. They were commonly tucked into mummies� bandages, they were meant to protect the mummy from evil, says Strudwick. Construction workers in Peru find two mummies. Two mummies were found on February 12, 2004, by construction workers digging at a state school in the coastal province of Islay, Peru. Officials from the National Institute of Culture said the two mummies � a young boy and a man in his mid-30s � were at least 700 years old. The two bodies were buried separately, wrapped in red and blue cloth. They were laying in a fetal (like a baby) position and were buried about 10 feet deep. Corn husks were found inside their funeral clothes. The boy of about 5 was buried in a small tomb of stones. The man, about 35 years old, was probably a farmer because he had bags of seeds attached to his belt and a spade buried with him. Archeologists have uncovered thousands of mummies in Peru in recent year, but these were among the oldest mummies ever found. They came from a culture that existed before the Incas and lived from Colombia to Chile. The mummies were on display for 30 minutes on February 23, but are now being cleaned and studied by archeologists. Stolen Filipino Mummies are returned to their Home. Back in the 1960s and 1970s, a group of mummies was stolen from a burial area in the Philippines. Mummies have been buried in this area for hundreds of years. Some people have been trying to sell the stolen mummies in the United States and in Europe. Some of the mummies have been recovered and this has made some archaeologists very happy. The mummies were made by a tribe called the Ibaloi. They were made between 1200 and 1500 CE. One of the mummies in the group is called the "Smiling Mummy" because the mummy still has all his teeth. The mummies were originally found in caves by a town called Kabayan which is north of the city of Manila. Archaeologists took the mummies back to the caves where they came from and laid them to rest. There is an organization called Monument Watch that monitors archaeological sites around the world. Monument Watch has the caves on their Top 100 Most Endangered Sites in the world. The skeleton of a lion that was mummified was found in a tomb south of Cairo, Egypt. Archaeologists have discovered a preserved lion skeleton in an ancient Egyptian tomb. This is the first time anyone has ever found a lion. A French research team led by Alain Zivie found the lion's skeleton in November of 2001 when they excavated the tomb of Maia who was a wet nurse for King Tut. Ancient Egyptian hieroglyphs talk about the breeding and burial of lions, but no lion remains have ever been found until now. The lion skeleton was complete and undisturbed. It was found in an area of the tomb dedicated to a cat goddess called "Bastet." The area also had alot of bones from people and animals including many cats. The lion's bones were not wrapped in linen like human mummies. But certain things about the bones, like their position, their color, and mineral deposits on the bones, are like bones of other mummified cats that were discovered nearby. The French researchs said the lion lived to be old. They could tell by the condition of the lion's teeth. Mr. Zivie says the lion may have been considered to be an incarnation of the god "Mahes" who is the son of Bastet. So far, archaeologists have found big cemeteries for baboons, ibis (a kind of bird), fish, smaller cats, dogs, and crocodiles. To mummify a large animal like a lion would cost alot and take alot of time. Vietnamese scientists restore the mummy of a 17th century Buddhist monk. Scientists in Vietnam worked to restore the mummy of a 17th century Buddhist monk. The name of the monk was Vu Khac Minh. He was an abbot. When Vu Khac Minh died, he was mummified using lacquer, saw-dust, and tissue paper. This is a special type of mummification that happens only in Vietnam. The scientists hope their work will preserve this type of mummy for future generations to see. 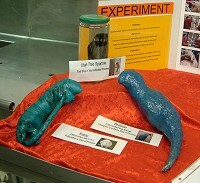 After the scientists finished, they placed the body inside a glass case. The case is in the Dau pagoda which is near Hanoi. Hanoi is the capital of Vietnam. The Dau pagoda is very old and Vietnamese Buddhists have been going there to worship for nearly two thousand years. A long time ago, Vu Khac Minh, the mummified monk, was trying to reach "nirvana." Nirvana is also called enlightenment and it is a special place according to Buddhist teachings. When someone reaches nirvana, they break out of the cycle of reincarnation. Reincarnation is when you are born over and over. So Vu Khac Minh closed himself in a room so he could meditate. He told his friends not to disturb him for a hundred days. After a hundred days, his friends found him. He was dead. But his body was amazingly preserved. His friends then covered his body with layers of sawdust and lacquer which turned him into a preserved mummy body statue. But that was a long time ago and his body statue started to crack. So the scientists used some paint and wood dust to fix the cracks. They painted the mummy body statue with gold paint and put it in a special box to keep the temperature and air just right. 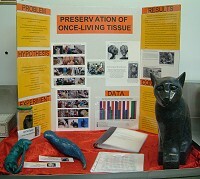 ...for their science project on Modern Mummification. 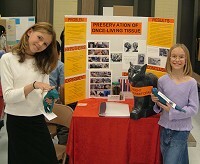 They qualified to enter their project in the district science fair competition.